Italy has deep Catholic roots and with the seat of the church based at the Vatican, it’s no surprise that Christmas remains a traditional affair for many Romans. From universal traditions like decorating homes and public squares with nativity scenes, to lesser-known customs like La Befana, here’s how to celebrate the holidays in the Eternal City. Unlike in the UK, where Christmas seems to come earlier every year, Italy’s festive calendar is pretty fixed. In Rome, lights and decorations generally start to appear around the beginning of the month but it’s the Immaculate Conception on December 8 that really marks the beginning of the season. First taking place in 1982, the tradition of placing a giant Christmas tree in St. Peter’s Square is a relatively new way to mark the festival season in Rome. This year’s fir comes from the archdiocese of Elk, in northeastern Poland, and will be decorated with stars and baubles designed by young cancer patients from several Italian hospitals. Presepe directly translates to crib but more accurately describes the nativity scenes on display in many homes and public squares across Italy. Often large, sprawling scenes which depict Jesus’ manger in great detail, presepi are traditionally put up on December 8 and taken down on January 6, the Epiphany. 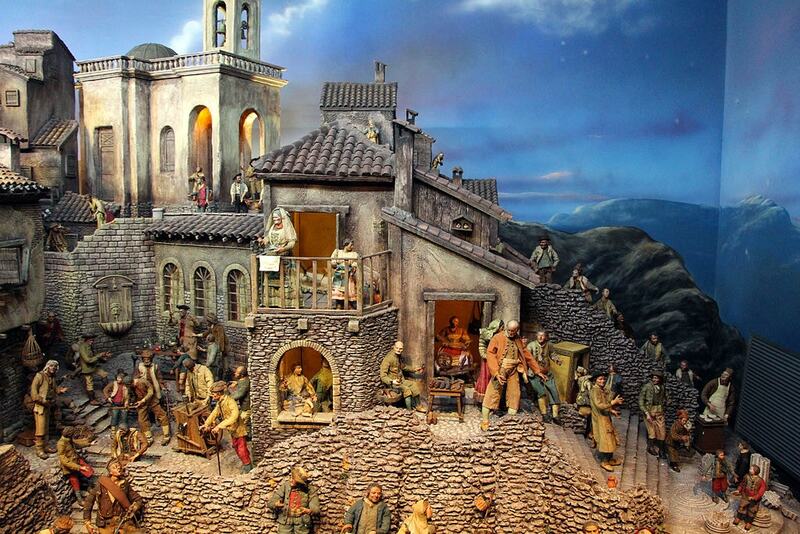 To see just how complex these miniatures can be, head to the annual 100 Presepi exhibition at the Church of Santa Maria del Popolo. In the Roman Catholic church Christmas Eve is a day of fasting and abstinence. The Feast of Seven Fishes is the traditional evening meal that takes place on La Vigilia (Christmas Eve). There’s no meat on the menu but seven seafood courses instead. These days, it’s not imperative to prepare the full seven dishes and in Roman kitchens the local specialty of dried salt cod, known as baccalà, is popular. 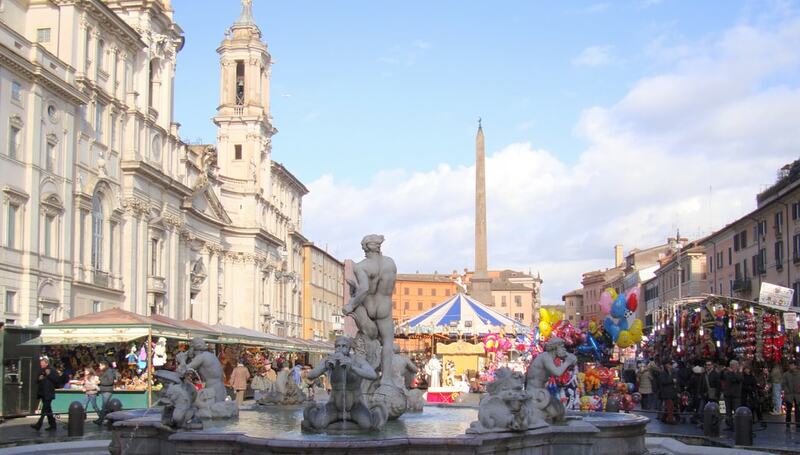 At its best, the Christmas Market in Piazza Navona is composed of stalls selling handmade gifts, sweet treats and festive decorations, an old fashioned carousel, a twinkling Christmas tree and a traditional nativity scene. However, in typical Roman fashion, it often courts controversy over which vendors are awarded permits. As a result, the size and content of the market is always temperamental – but it wouldn’t be Christmas in Rome without heading to Piazza Navona to find out what’s in store this year. While turkey is becoming a more frequent addition to the Italian Christmas table, roast lamb, chicken or pork are all traditional options. Of course, there’s always pasta, which in Rome is often in the form of tortellini in brodo – filled pasta served in broth – a dish that originally comes from the Emilia-Romagna region. Don’t forget to save room for a slice of panettone or pandoro. Unsurprisingly the Pope has a packed schedule in December so there are a number of opportunities to celebrate Christmas together. Join him at Piazza di Spagna on December 8 when he places a wreath at the base of the Column of the Immaculate Conception and offers prayers to the crowd. 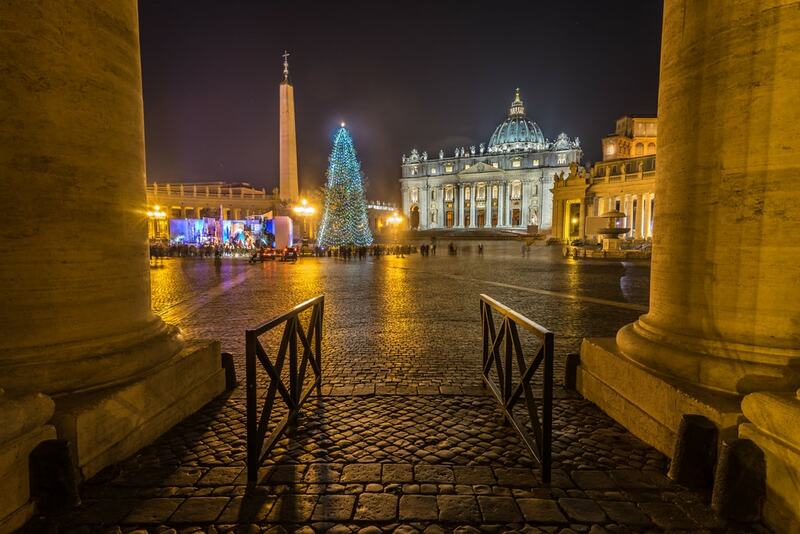 Get tickets in advance for the traditional Christmas Eve mass in St. Peter’s Basilica, or just show up on December 25 for the special Urbi et Orbi blessing in the square outside. In Italy, it’s not Santa Claus who showers children with gifts but La Befana. The story goes that the Three Wise Men knocked on her door in search of directions. The old woman couldn’t help but let them stay the night. After they left, she realised she too wanted to join the search. To this day, La Befana still flies around on her broomstick, looking for Christ. On January 5, the eve of the Epiphany, she leaves sweets in the stockings of well-behaved boys and girls. This marks the end of the season’s festivities – l’Epifania, che tutte le feste si porta via!